A New Spelling Champion And Walmart Adds A College Option For Workers : NPR Ed Also in our weekly education news roundup: The Santa Fe schools received funding for recovery, and a new study examines social and emotional learning at different ages. Karthik Nemmani, 14, of McKinney, Texas, holds the Scripps National Spelling Bee Championship trophy with Adam Symson, the Scripps president and chief executive officer. 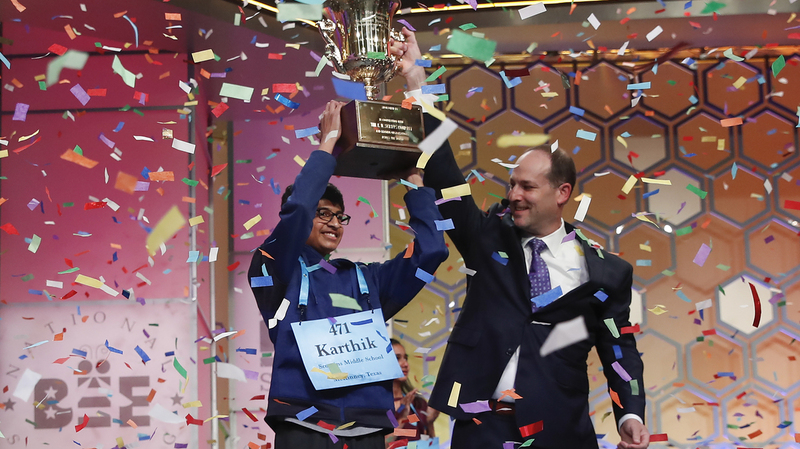 On Thursday, 14-year-old Karthik Nemmani correctly spelled koinonia — a Greek word that means Christian fellowship or communion — to win the Scripps National Spelling Bee. The annual event, held this year in Oxon Hill, Md., was runner-up Naysa Modi's fourth national bee. The 12-year-old correctly spelled the words pareidolia, myrmecophagous, and forçat before the word that tripped her up: bewusstseinslage. One dollar per day is all that Walmart employees will need to pay to take online classes toward a college degree. The company announced this week that it will cover the rest — including books and other fees. Walmart said it is partnering with a Denver-based startup, Guild Education, which provides employer-based education benefits. All 1.4 million full- and part-time Walmart employees will have the option — once they've been on the job for 90 days — to pursue an associate's or bachelor's degree online. Degrees in business or supply chain management will be available from one public university — the University of Florida — and from two private, nonprofit schools, Brandman University and Bellevue University. In a news release, the company said it chose these programs because of their focus on adult learners — a group that makes up almost one-third of undergraduates in the U.S. today. Walmart already offers its employees and their family members free access to an online high school diploma. The company also offers workers GED preparation and testing. Students at Santa Fe High School in Texas headed back to school on Tuesday, 11 days after a shooter killed 10 people there. The tragedy left many struggling with trauma, and on Thursday, Education Secretary Betsy DeVos announced that Santa Fe Independent School District will receive a $1 million Project SERV grant. The School Emergency Response to Violence grants pay for recovery efforts in districts that have undergone traumatic events. The Broward County, Fla., schools received $1 million after the Parkland shooting in February. On Wednesday, the Republican governor of Texas, Greg Abbott, announced his plan for making schools safer. His vision includes what he calls "school-hardening strategies," such as increasing police presence in schools and arming additional school personnel. Some experts maintain that preventing school violence requires greater attention to cultivating social and emotional learning, reducing harsh discipline practices and devoting more resources to mental health. A new study tracks levels of social and emotional learning in school-age children and finds differences by gender, race and ethnicity, and family income. The report, from Policy Analysis for California Education, used survey responses from hundreds of thousands of students in a network of urban district in the state. The researchers looked at four key areas of social and emotional learning: self-management, self-efficacy, social awareness and growth mindset. One key finding? "Girls report higher self-management and social awareness than boys," the researchers write, "but their self-efficacy drops sharply relative to boys in middle and high school." White students reported higher levels of social-emotional learning than African-American, Latino students. Economically disadvantaged students described lower social-emotional skills than other students — but the gaps in most measures decreased through high school. The findings could be for a few reasons, the study says. One possibility is that students of color and economically disadvantaged students are more likely to report experiencing trauma, which could affect their learning. Students of color "rate their school's culture and climate less favorably than do their white peers, even when they attend the same school," the researchers noted.